Rat Mesenchymal Stem Cells (RMSC) have the potential to maintain multipotency and proliferate extensively in vitro. 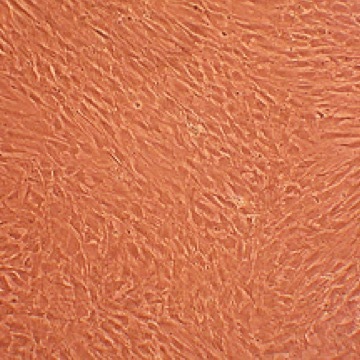 Bone marrow is the major blood creating organ, but in addition to supporting hematopoietic growth and differentiation, marrow stromal cells can be induced to produce cells of other connective tissues, such as bone, cartilage, and fat, as well as cells from neuroectodermal (neurons) and endodermal (hepatocytes) lineages. (Click to Enlarge) Rat Mesenchymal Stem Cells: RMSC. Isolated from the bone marrow, these cells support hematopoietic growth and differentiation, and can be induced to produce bone, cartilage, fat, neurons and hepatocytes. Parashurama, N. B. Ahn, K. Ziv, K. Ito, R. Paulmurugan, J. Willmann, J. Chung, F. Ikeno, J. Swanson, D. Merk, J. Lyons, D. Yerushalmi, T. Teramoto, H. Kosuge, C. Dao, P. Ray, M. Patel, Y. Chang, M. Mahmoudi, J. Cohen, A. Goldstone, F. Habte, S. Bhaumik, S. Yaghoubi, R. Robbins, R. Dash, P. Yang, T. Brinton, P. Yock, M. McConnell and S. Gambhir. 2016. Multimodality Molecular Imaging of Cardiac Cell Transplantation: Part I. Reporter Gene Design, Characterization, and Optical in Vivo Imaging of Bone Marrow Stromal Cells after Myocardial Infarction. Radiology, 280:815-825. Gershlak, J. and L. Black. 2015. Beta 1 integrin binding plays a role in the constant traction force generation in response to varying stiffness for cells grown on mature cardiac extracellular matrix. Experimental Cell Research, 330:311-324. Yang, C., J. Wang, S. Chen, Y. Jan, and Y. Hsieh. 2015. Enhanced functional recovery from sciatic nerve crush injury through a combined treatment of cold-water swimming and mesenchymal stem cell transplantation. Neurological Research, DOI: http://dx.doi.org/10.1179/1743132815Y.0000000060. Neculaes, V., K. Conway, A. Gerner, E. Loghin, S. Yazdanfar, D. Dylov, B. Davis, and C. Joo. 2014. Optical based delivery of exogenous molecules to cells. Patent US 8778682 B2. Sullivan, K., K. Quinn, K. Tang, I. Georgakoudi and L. Black. 2014. Extracellular matrix remodeling following myocardial infarction influences the therapeutic potential of mesenchymal stem cells. Stem Cell Res & Ther, 5:14. Ziv, K., H. Nuhn, Y. Haim, L. Sasportas, P. Kempen, T. Niedringhaus, M. Hrynyk, R. Sinclair, A. Barron and S. Gambhir. 2014. A tunable silk–alginate hydrogel scaffold for stem cell culture and transplantation. Biomaterials, 35:3736-3743. Gershlak, J.R., J.I.N. Resnikoff, K.E. Sullivan, C. Williams, R.M. Wang, and L.D. Black Iii. 2013. Mesenchymal stem cells ability to generate traction stress in response to substrate stiffness is modulated by the changing extracellular matrix composition of the heart during development. Biochemical & biophysical research comm. 439:161-166. Brammer, K.S., C. Choi, C.J. Frandsen, S. Oh, and S. Jin. 2011. Hydrophobic nanopillars initiate mesenchymal stem cell aggregation and osteo-differentiation. Acta Biomaterialia. 7:683-690. Sommani, P., H. Tsuji, H. Sato, Y. Gotoh, and G. Takaoka. 2011. Osteoblast Patterning on Silicone Rubber by using Mesenchymal Stem Cells and Carbon Negative-Ion Implantation. Transactions of the Materials Research Society of Japan, 36:317-320. Tsuji, H., P. Sommani, Y. Hayashi, H. Kojima, H. Sato, Y. Gotoh, G. Takaoka, and J. Ishikawa. 2011. Surface modification of silica glass by CHF3 plasma treatment and carbon negative-ion implantation for cell pattern adhesion. Surface and Coatings Technology. 206:900-904. Sommani, P., H. Tsuji, H. Kojima, H. Sato, Y. Gotoh, J. Ishikawa, and G.H. Takaoka. 2010. Irradiation effect of carbon negative-ion implantation on polytetrafluoroethylene for controlling cell-adhesion property. Nuclear Instruments and Methods in Physics Research Section B. 268:3231-3234. Tsai, L.-K., Y. Leng, Z. Wang, P. Leeds, and D.-M. Chuang. 2010. The Mood Stabilizers Valproic Acid and Lithium Enhance Mesenchymal Stem Cell Migration via Distinct Mechanisms. Neuropsychopharmacology. 35:2225-2237. Zhang, F., S. Tsai, K. Kato, D. Yamanouchi, C. Wang, S. Rafii, B. Liu, and K.C. Kent. 2009. Transforming Growth Factor-β Promotes Recruitment of Bone Marrow Cells and Bone Marrow-derived Mesenchymal Stem Cells through Stimulation of MCP-1 Production in Vascular Smooth Muscle Cells. J. Biological Chemistry. 284:17564-17574.